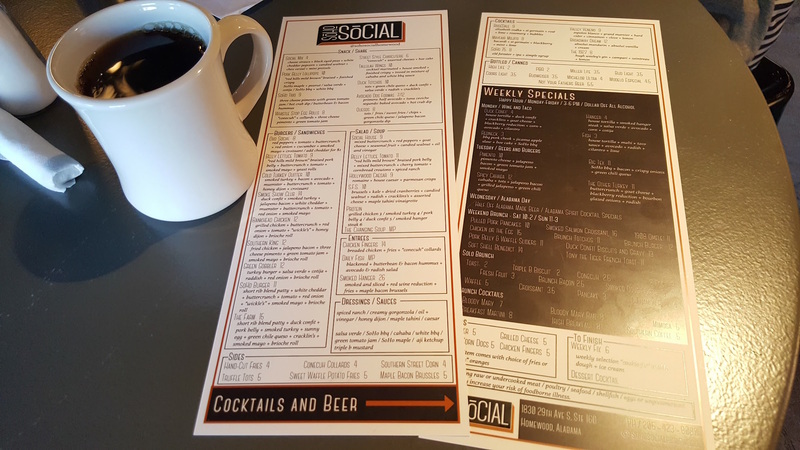 Soho Social Serves up Delicious Food in a Great Homewood Location! Whether it's Happy Hour or Brunch, SoHo Social is a Great Hangout Spot! From the people who brought you MudTown and The Ridge, comes SoHo Social! 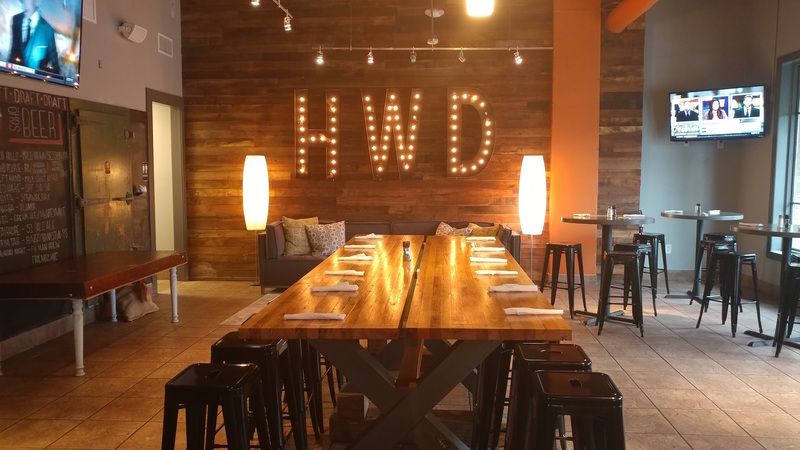 This is Homewood's newest restaurant/hangout spot and, yes, they have BRUNCH!!! If there's one question we get multiple times a week it's, "Where's a good place for brunch?" Luckily, SoHo Social will be serving it up every Saturday and Sunday! After stopping in on opening day and learning about the brunch menu we decided to come back on the weekend to try it out. As soon as you walk into SoHo Social you can tell it’s not your typical restaurant. It’s set up to promote, well, being social. 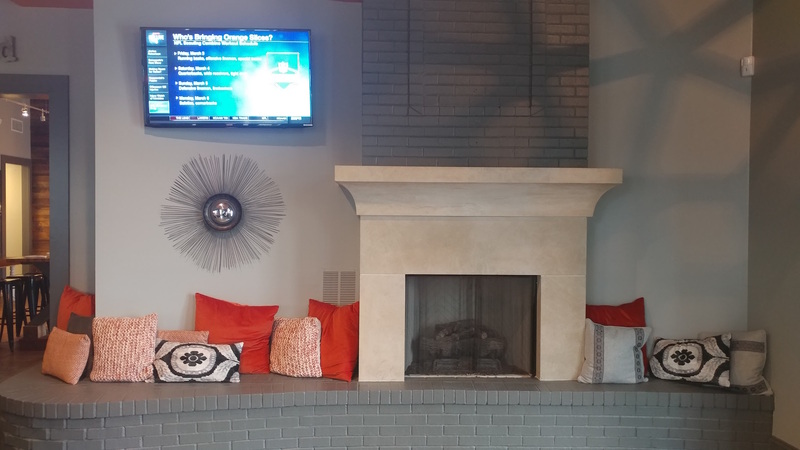 From the contemporary hearth to the open floor plan with multiple lounging areas, the space is warm and inviting. There is a restaurant style eating area and bar, but there’s also a side room that is perfect for relaxing with friends. This area includes sofas, accent chairs, rugs, and even a long family style table that is perfect for 8-10 guests. 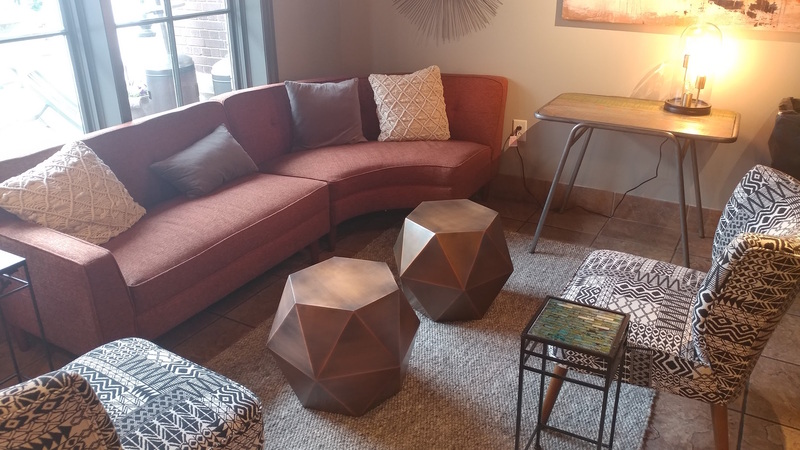 If you don’t have a large group this table is a great way to interact with new people as you enjoy the amazing food and drinks SoHo Social has to offer! You can also take advantage of this early Spring weather out on the expansive patio section. 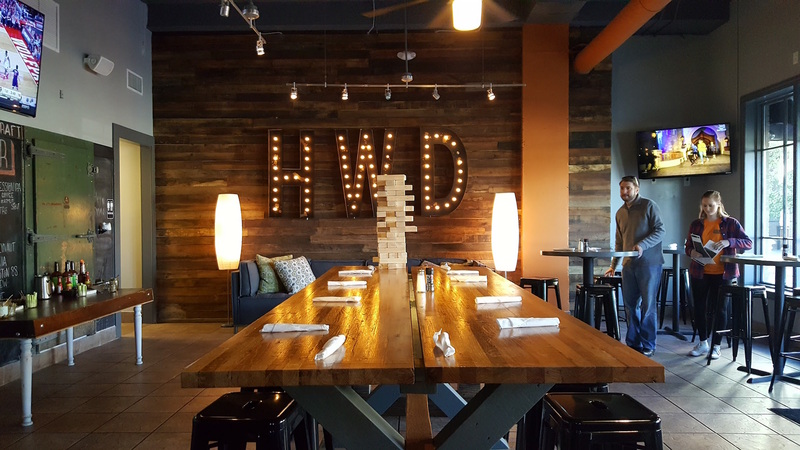 We are big fans of both Mudtown and The Ridge in Vestavia, so we were thrilled to learn that SoHo Social is managed by the same people. The food is a creative twist on southern fare with an emphasis on local ingredients. 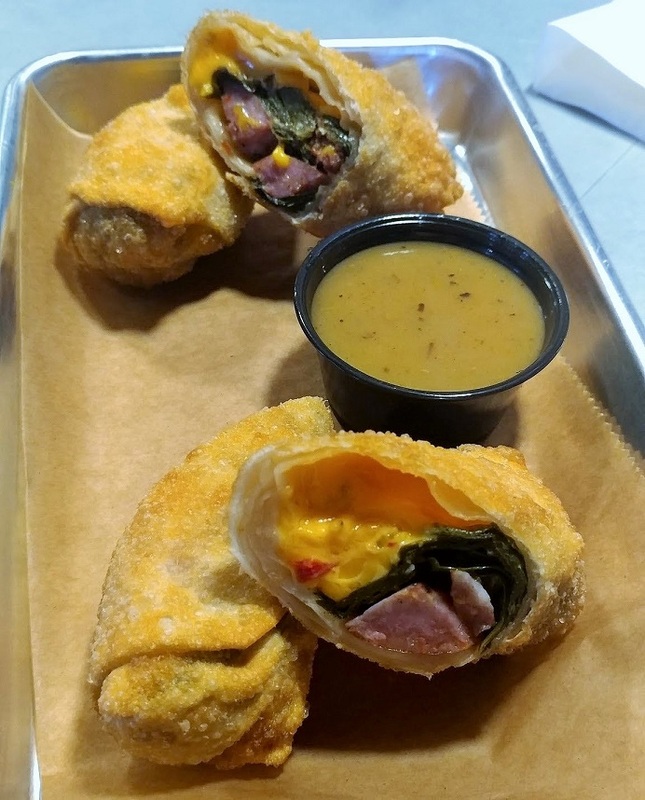 The first time we stopped by we sampled the “Whistle Stop Eggrolls” which are comprised of Conecuh Sausage, a three cheese pimento, and greens from AL Hooks’ produce (great name) all wrapped up and fried eggroll style! These are a must try for your first visit! Local is always a plus! Just like the Eggrolls, each dish incorporates Alabama based ingredients. Not only is the food tasty, it also supports local farmers. 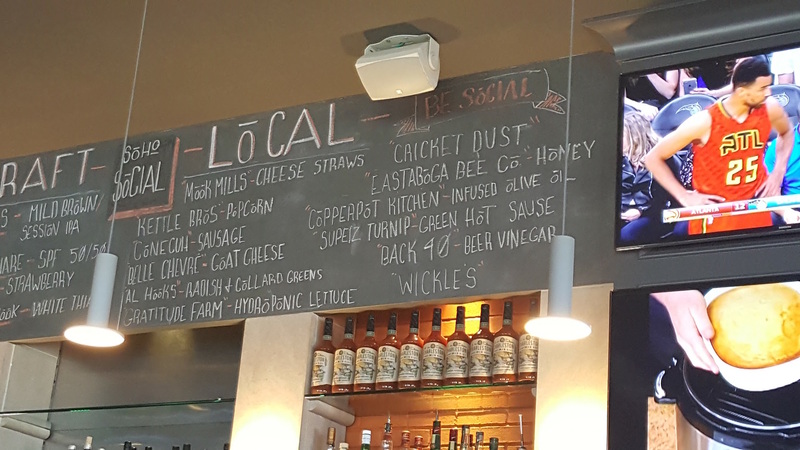 SoHo Social has two chalkboards that list out the local ingredients they use and the suppliers they come from as well as the local breweries they have on tap. Take a minute after you order and look some of them up on social media to show your support! As we mentioned earlier, we always get asked about local brunch locations, so of course we had to try the brunch menu for ourselves. 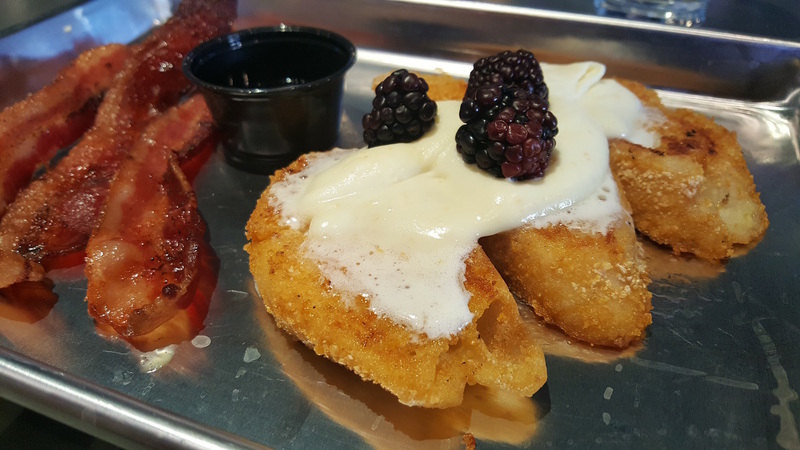 While the Birmingham area does have a number of great brunch spots, we have found that a lot of them don’t serve brunch on a consistent basis. Fortunately, SoHo Social serves brunch every Saturday and Sunday! We stopped in late one Sunday morning and got a hightop table near the bloody mary bar. (We’ll get to that in a minute.) We ordered coffee, which is freshly ground in-house, and started making the tough decision about what to order. The brunch menu is robust, so take some close friends or family that don’t mind sharing a bite or two whichever dish they decide on. After deciding on food, we ordered coffee and a bloody mary. 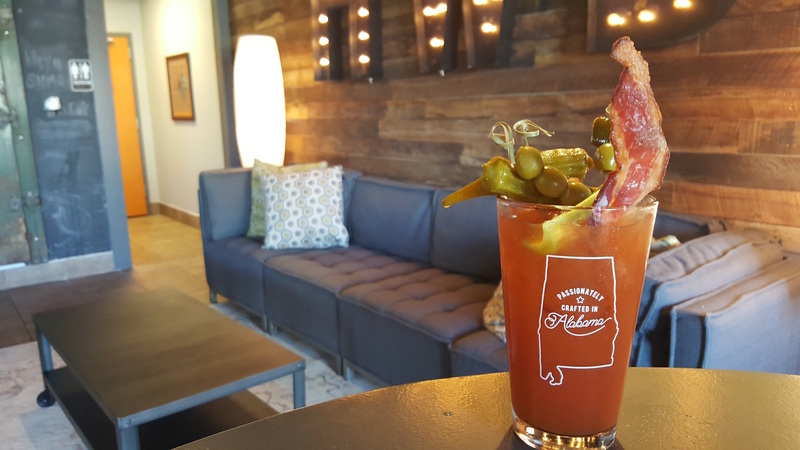 They have an impressive “do it yourself” bloody mary bar that features multiple mixes and garnishes including okra, peppers, olives, and even fresh slices of bacon! The server will bring you a pint glass of ice and vodka then you can build your own drink from there. It’s worth noting that they have at least three types of bacon, regular, candied, and jalapeno style. The first dish we tried was the "Tony the Tiger French Toast." It is made using french bread that is topped with a light orange flavored creme, blackberries, and is coated with Frosted Flakes before being cooked. To quote Tony the Tiger, “They’re Grrrreat!” It's light, crunchy, and full of flavor. It is served with a side of candied bacon which is delicious! Next up were the Pork Belly & Waffle Sliders! While they are called "sliders" this is more like two sandwiches due to it's size. 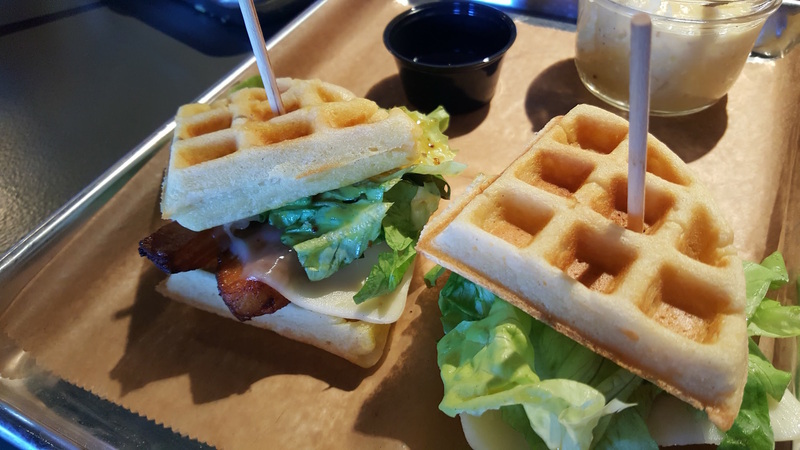 The buns are made of a quartered waffle that has been cooked to perfection! It comes with cheese, lettuce, and pork belly. The pork is flavorful and meatier than most pork belly we have had in the past. This also came with the "Gouda Grits" which we were glad to have a second helping of. Before we dive into this one there's one thing you should know. It has REAL CRAB! Not only are dishes with real crab hard to find, finding one at this price point is like a brunch unicorn! This omelette doesn't stop there. 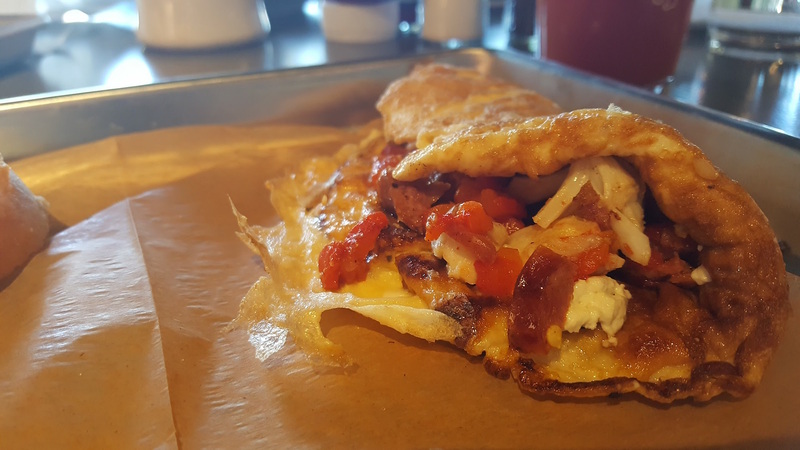 It's also stuffed with red peppers, Conecuh Sausage, and goat cheese! Despite all of these great flavors you can still tell the crab is real with each bite. All of these ingredients are great on their own, but take on a whole new level of flavor when wrapped up in a fresh omelette! It comes served with "Smoked Gouda Grits." and a warm biscuit! 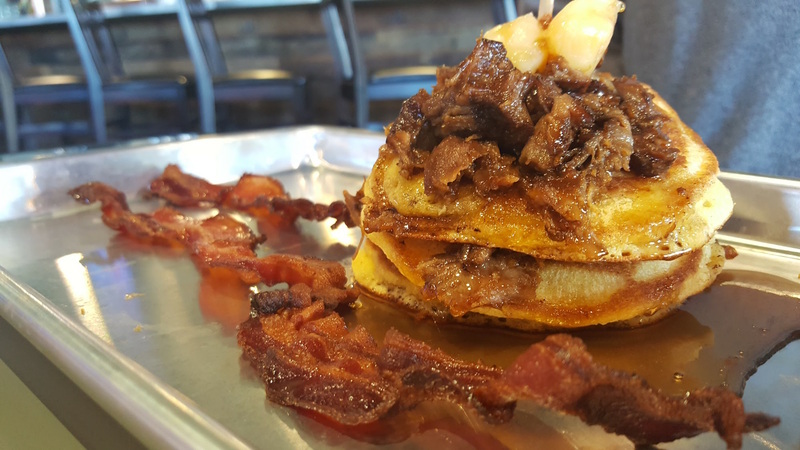 Oh, the "Pulled Pork Pancakes!" First, this is the "Big Mac" of the SoHo Brunch menu. The pancakes are made "hoecake" style, which means they are made with sweet cornmeal and lightly fried in some pork fat just long enough to brown them. The pork is tender and tastes like it is freshly pulled. This layered dish is served with bacon and syrup and we ate every single bite! We had a wonderful experience and great service at SoHo Social and can't wait to go back with friends! 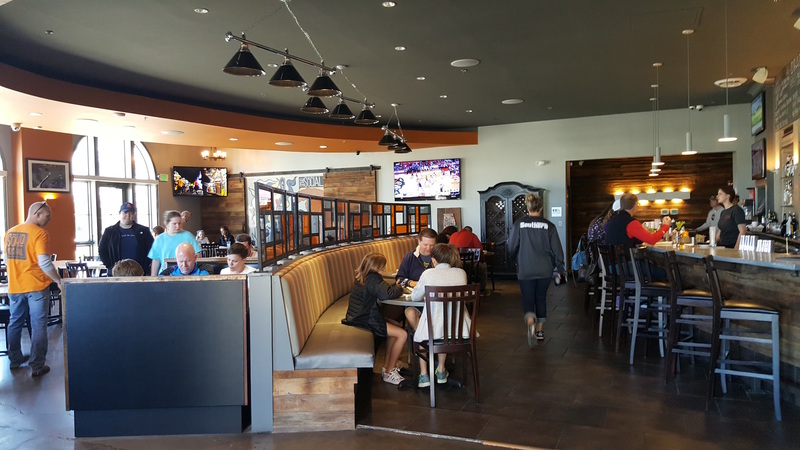 It has already become a popular spot for the happy hour crowd, is family friendly, and is a great place to unwind with while enjoying all the amazing food and drinks they have to offer!